The great astronomer Edwin Hubble did plenty of extraordinary science  he gathered the first convincing evidence of an expanding universe, for example  but he also collected galaxies the way a leipidopterist collects butterflies, and he classified them into two major groups: pinwheel-shaped spirals like the Milky Way and Andromeda, and blobby ellipticals. What Hubble didn't know  but modern astronomers do  is that elliptical galaxies are born when two spiral galaxies collide. These cosmic crashes scramble the spirals' original structure, creating one big, amorphous mess. Star formation, which had been vigorous and ongoing in the original spiral, grinds to a halt, and two dashing young galaxies are transformed into an old, tired-looking collection of aging stars. That's the what, but astronomers have long pondered the how. Why should the rejuvenating process of star formation stop when two galaxies become one? Theorists had some ideas, but nobody had actually caught an elliptical galaxy in midshutdown  until now. Training a suite of space telescopes on the galaxy NGC 3801, about 160 million light-years from Earth, an international team of astronomers has shown that star formation is extinguished with a one-two punch: exploding stars followed by a giant, belching black hole. Here's how it played out, according to a new paper in the Monthly Notices of the Royal Astronomical Society: Two spirals slammed together a billion years or so ago, their stars flinging one another into new, random orbits and their gas clouds colliding to form shock waves that gave birth, for a little while, to new, massive, hot stars. The new stars burned through their fuel very rapidly and exploded as supernovas, driving some of the leftover gas  the stuff new stars are made of  out toward the galaxy's fringes. This alone wouldn't have shut off further star formation. But just like all spiral galaxies, including the Milky Way, the two that crashed to form NGC 3801 had supermassive black holes lurking in their cores. 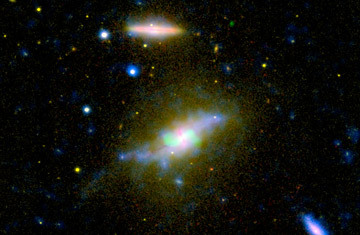 In the shakeup following the collision, some gas clouds would have been sent spiraling into these cosmic vacuum cleaners. In their frenzied effort to gobble up the gas, the black holes would have emitted high-speed jets of matter, and these would drive off the remaining gas. Using the Galaxy Evolution Explorer telescope, or GALEX; the Spitzer Space Telescope; the Chandra X-ray Observatory; and the Hubble Space telescope, lead author Ananda Hota of the Academia Sinica Institute of Astronomy and Astrophysics in Taiwan found several smoking guns to confirm this scenario. GALEX, which records ultraviolet light, and Spitzer, which works in the infrared, both detected telltale signs that the star formation triggered by the merger is still going on, but at a very low level. And the Hubble has picked up gas being pushed out of the galaxy by recent supernovas. The truly massive shock waves rippling through gas clouds heated by the black holes, meanwhile, are generating X-rays, which can be spotted only with the Chandra observatory. The emissions are speeding away from NGC 3801's center at a frenetic 2 million m.p.h. (3.2 million km/h), or close to it. At that rate, any star-forming gas that's still hanging around will be driven out of the galaxy in about 10 million years  mere seconds from now in cosmic terms and so quickly that it's lucky Hota and his collaborators caught it at all. The whole process of transforming two young, vigorous galaxies into a single, feeble geezer, he estimates, takes about a billion years, which is still pretty fast considering that the spirals had probably been alive and healthy for 10 billion years or so before their unfortunate encounter. Hota was lucky, but skywatchers a good many generations from now are pretty much guaranteed to see the same thing happen a lot closer to home. The Andromeda galaxy, a slightly larger twin of the Milky Way, is so close, at just 2 million light-years or so, that the two spirals' gravity draws them toward each other all the time. Astronomers think a collision is inevitable, perhaps 3 billion years down the line. When that happens, observers on Earth will be able to watch from within the very thick of things as two youthful galaxies merge and grow suddenly old. They will, that is, if there are any observers left.